The Hawaii islands are very famous about beautiful sunset. In the Big Island sunset of Kona, western side of the island, is very popular because we can enjoy it with dinner. 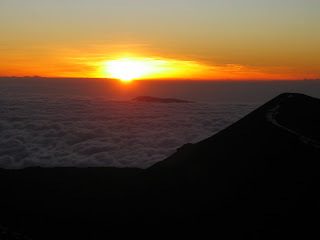 And sunset from the summit of Mauna Kea. Many sunset-seeing vans gather at twilight time. Hilo has many rain and sun sinks over the mountain so we cannot see beautiful sunset every day. But occasionally we can see such sun's evening glow. Back ground is the summit of Mauna Kea. Astronomical Observatories was silhouetted against the purple sky. These trees are pine of Norfolk. They are introduced species but they create some kind of unique air. Skyline of Mauna Loa is seen between electric wires. I am always fascinated by this mountain.